Cream Cheese Monkey Bread Recipe — Pip and Ebby - easy, delicious recipes! Monkey Bread with a cheesy, gooey little secret! 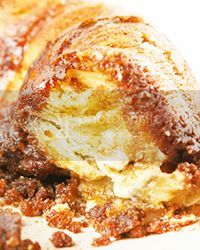 Stuffing the cream cheese into your dough makes a marvelous treat. Using buttermilk dough makes this so easy to thrown together. You will completely WOW guests with this sweet breakfast! Larry and I both believe that cream cheese makes everything better, and that is why this bread makes me think of her. It's true. Cream cheese does make everything better. Preheat oven to 350 degrees F. Spray a 12-cup bundt pan with cooking spray; set aside. In a medium bowl, combine the sugars and cinnamon; set aside. Slice 10 discs of dough from each tube of biscuits. Set discs on a flat surface and set one cube of cream cheese in the center of each piece of dough. Wrap edges of dough up and around the cheese so all that is visible is the top side of cream cheese cube. Place 10 dough-wrapped cheese cubes, cheese-side-up, in bottom of prepared pan. Top with half of the sugar mixture and half of the butter. Top with the remaining dough-wrapped cheese cubes, cheese-side-down, the remaining sugar and remaining butter. Bake in the preheated oven for 40 minutes. Invert onto a serving platter and serve. Chop up pecans and place them in the middle layer of the cream cheese and dough balls. Sprinkle chocolate chips over the monkey bread before you set it to bake. I had been thinking about doing a twist on good ol' gooey and delicious monkey bread. But what could possibly make monkey bread any better than it is? Then it occurred to me. CREAM CHEESE! It makes everything better, right? I'll be honest. I ate AT LEAST half of this thing by myself. I felt like a drug addict, eating just a few more bites, in a corner of our kitchen where nobody could see me. Cream cheese does make everything better, ooey gooey monkey bread not excluded. YUM.